I can’t very well claim compatibility with another speaker, having an audio buddy who owns them, and not try it out, can I? So, I hauled the M15 into my car and drove off to audio buddy Niels. I could have taken the opportunity to also include the M21 DAC and carry out all kinds of comparisons but this review is getting very long as it stands already so opted to stick with the amp. 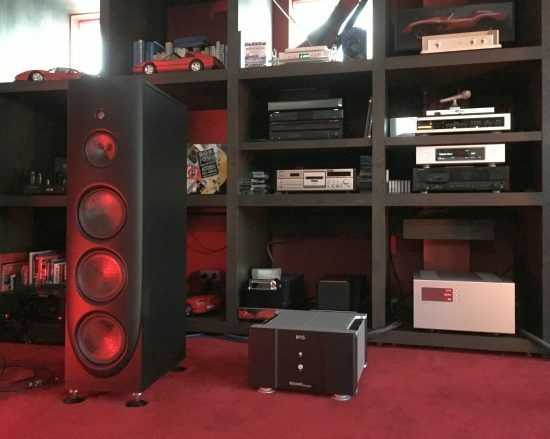 Niels’s system consists of a Spectral 30SV preamp, Aurender S10 music server, connected to the Zanden 5000 Signature DAC via an MIT Oracle MAX digital interlink, Soulution 711 power amp, and Magico Q5 loudspeakers. Cables between Zanden DAC and preamp are MIT Oracle MA cinch, XLR interlinks between pre- and power amp are MIT Oracle MA (with impedance setting “MID”) and speaker cables are MIT Shotgun Evo. 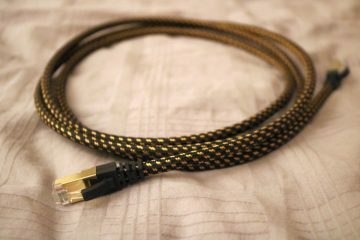 The power cable for both amps is an MIT Z-cord II, which is basically a Belden 19364 with a ferrite ring inside that big plastic cover. Prior to having been warmed up, the M15 sounds a little bit too soft and lacks incisiveness in the bass but even before being fully on song, the amp already delivers with such refinement and lack of hardness that it is really easy to get into. After only a couple of tracks, the M15 the aforementioned softness starts to disappear and the bass becomes tighter and more articulate, to a point after about 30 minutes where I would say it is spot on for this system. Sure, even when fully warmed up, the M15 does not achieve 711-levels of bass solidity. But if we’re honest, both Niels and I agreed that the difference was definitely smaller than we thought it would be. The Q5’s are in infamous for being hard to drive properly and even if the Soulution has a more solid and more controlled delivery, the M15 does not allow the speakers to become boomy or sloppy in any way, clearly, it has more than enough grip. As I suspected, with the Magico’s, there’s no shortage of articulation or transient sharpness. It’s just that the 711 does these things even better. The 711 is not only about (bass) power and control, though. In direct comparison, it also unveils more of the inner structures, the texture and other tiny clues that make up seemingly simple but actually complex sounds while portraying these in a more expansive soundstage. 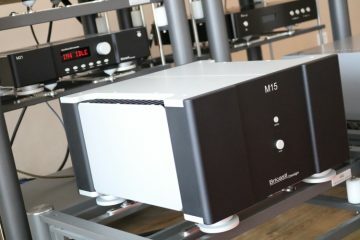 But after listening to the M15 for a while, these considerations sort of fade to the background and the amp’s highly natural delivery makes you sit and relax, and just listen to the music. The M15’s biggest asset, for me, remains its super-organic and natural midrange. There is something in this amp’s portrayal of piano and trumpet that is highly convincing for me. Fluid, tonally rich, and never edgy but with excellent dynamics and lots of bite. I also hear this in my own setup with the Kroma’s but here with the Magico’s, the effect seems even more profound, likely because these speakers can also sound, well, quite uninvolving, in lesser circumstances. The 711, by contrast, has a more solid delivery (squarer, if you will), making transients such as drum whacks or piano notes “pop” more. To me, and with the Magico’s, I sometimes found that to be a little bit too much even if it adds a certain excitement that can also be quite entertaining. In terms of treble performance, the M15 is closer to the 711 then the latter was to the A1.5, although the M15 is slightly sweeter than the Big Swiss and smoother overall. This was a rather surprising little escapade and even though Niels won’t be trading in his 711 for an M15, we both came out respecting the M15 even more. Niels even admitted that if he did not have the 711, he could probably happily live with the M15. Just like the M15 amp, the M21 DAC is fitted with beautifully sculpted custom-made Stillpoint feet. 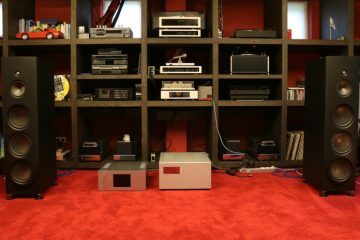 Seeing as I had already heard the beneficial effect with the power amp, this was one of the first things that I tested and indeed: on its own feet, the M21 sounds most articulate and concrete and this is how I continued to review it. 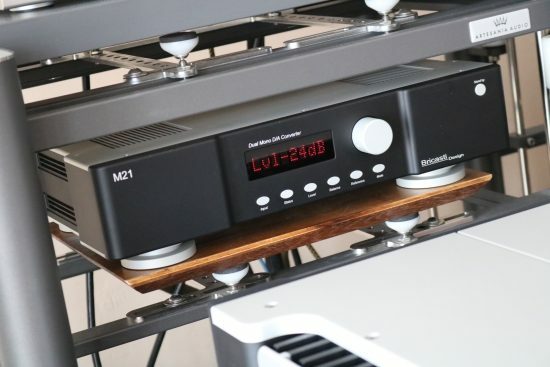 Connected directly to the CH Precision A1.5 amp, the M21 is used as a DAC and preamp. To start off, I set it to Ladder DAC decoding using a linear filter. 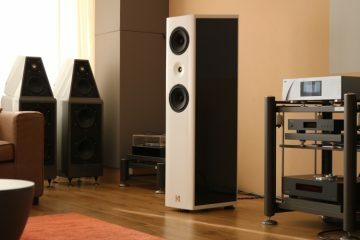 Coming from the CH Precision C1 (also used with its own volume control), the Bricasti M21 is a little lighter on its feet with less obvious propulsion in the bass and slightly softer on the transients in generic (or less square, depending on your view) but it is definitely highly detailed and easily as transparent and refined as the C1. Its most impressive quality I would say is its fluidity. From my earlier experiences with the M1, I already knew that the DAC has a rare combination of smooth fluidity, supreme transparency, and excellent resolution. Whether or not the M21’s analog volume control is superior to the M1’s digital control (I bet it is), that my taste has changed (I know it has) or that my current system is more agreeable for use without a preamp, it may very well be, I have a feeling that the M21 sounds purer and perhaps more dynamic than the M1. In any event, clearly, the combination M21 + CH A1.5 is working extremely well. Even if the M21 is more slender in the bass (but definitely not lightweight) and less explicitly differentiated (more rounded / less analytical, pick your favorite) than the C1 in direct comparison, it is highly transparent, very dynamic and very revealing nonetheless. But the bottom line is that in every listening session, the M21’s effortless and super-fluid musicality quickly takes me out of my head and I find myself just relaxing in the music. And after a couple of tracks, my slight reservations relative to the C1 are gone. “Yup!”, I often found myself thinking. 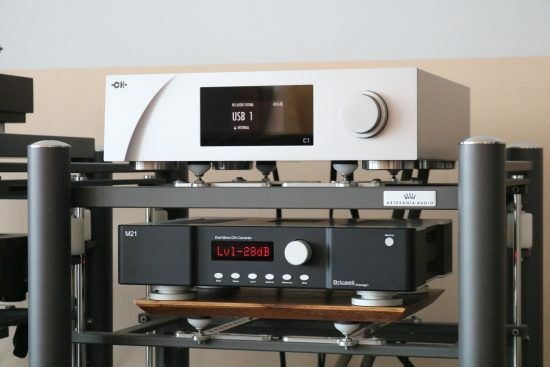 This DAC I could certainly live with! Normally, I would also make comparisons to other DACs using an external preamp but with the M21 I feel that this would be missing the point. From these results, it is abundantly clear to me that the M21 is born to be used without an external preamp. It sounds just perfect that way and I honestly can’t imagine what could be gained, without affecting any of its many positive attributes, by adding another gain stage. The M21 has quite a unique range of features, one of which is the inclusion of three separate D-A Converters! 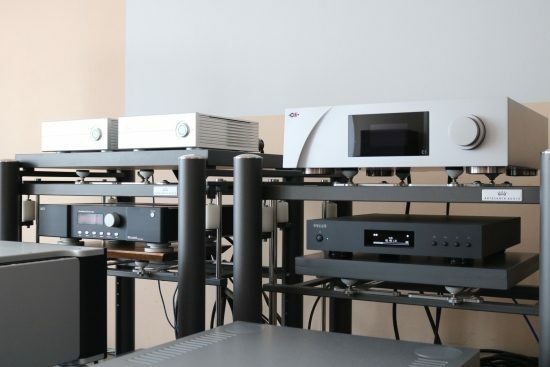 There’s a Ladder DAC for PCM signals, a Delta/Sigma DAC for PCM and DSD signals, and a proprietary discrete analog and filter-less DAC, purely for DSD. 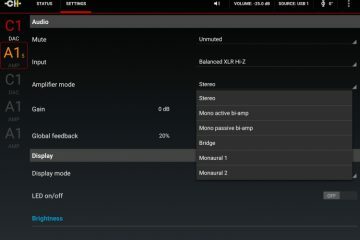 So, no matter the format, one always has two DAC options for playback. At Bricasti, the belief is that upsampling PCM to DSD is not the way to go and I wholeheartedly agree. I strongly feel that every format should be converted natively. Oversampling within the linear digital domain itself is no issue, as long as it is done in even numbers, which is how it is done in the M21. Changing the DAC from Ladder to Delta/Sigma makes for a subtle change that, as far as I am concerned, serves nicely to demonstrate the Ladder DAC’s superiority. While the Delta/Sigma setting appears to be just as open and detailed, perhaps even a little bit more precise, I find that it makes the M21 sound a little softer (more rounded) in the bass transients (or, again, less square, if you will) and slightly filtered throughout the midrange, less pure and direct. To me, the Ladder DAC setting sounds more crispy and more convincingly real. 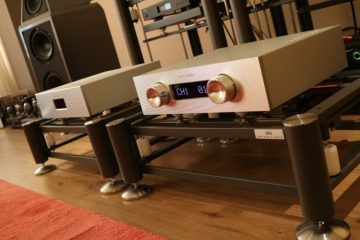 In a system that sounds a little bright or hard, however, one may well prefer the gentler Delta/Sigma setting and that’s why it is so great to be given a choice between the two. For use with these two DACs and with PCM sources only, there is the option to choose between two digital filters: Linear Phase and Minimum Phase. As indicated, I started with the former as I found it to be my favorite. Switching to Minimum Phase, the M21 sounds a little darker and slightly less articulate and crispy. You could also say that Minimum Phase sounds more relaxed and Linear Phase sounds more dynamic. System synergy will dictate what sounds best in a given situation. For DSD conversion, one can choose to use the same Delta/Sigma converter or use the proprietary discrete, analog, filter-less pure DSD output. For me, DSD is more a marketing thing than a format that I actively use. Of all the albums that I collected as files so far, most are upsampled from PCM masters and precious few truly sound good. But it has to be said, when using one of the few really good DSD files, the M21 can also sound quite incredible. 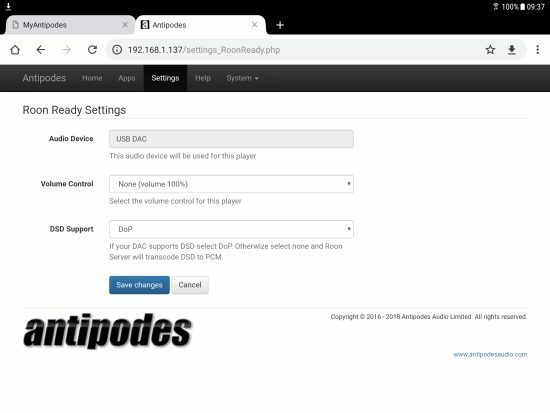 To enable pure DSD to pass through and the M21 to convert it directly without letting Roon convert it to PCM, be sure to set DSD Support to DoP in the RoonServer settings of the Antipodes settings (accessible in any browser via myantipodes.com). 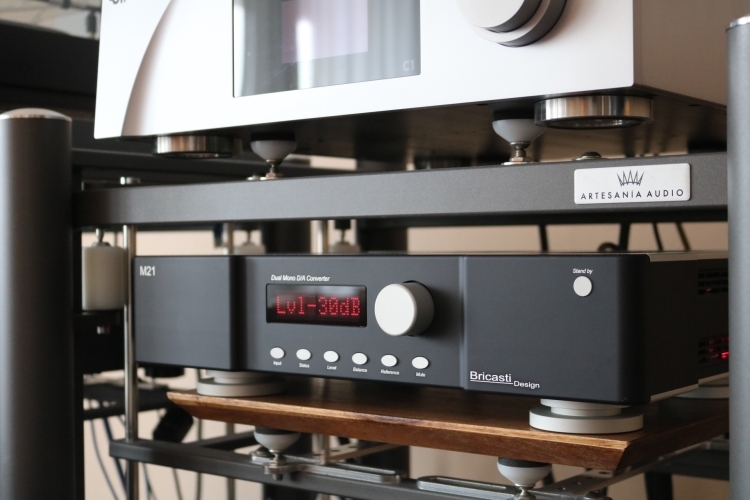 Using its regular Delta/Sigma converter, the usual difference between PCM and DSD can be heard, meaning an airier and more continuous treble and higher resolution than with Redbook recordings. The downside usually is that the bass is less solid and has less propulsion and drive than it has when playing the same album in PCM, either Redbook or Hi-Res. The same is heard with the M21 and so this will very much be up to individual taste. 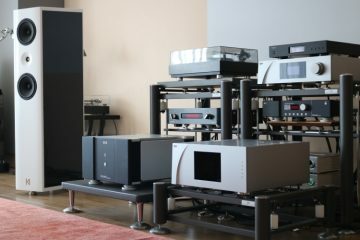 However, where the M21 makes the difference, is when using its proprietary discrete and filterless DSD conversion method. Used this way, the DSD recordings still sound less propulsive in the bass than with PCM but with an amazing sense of being utterly unrestrained from any technical influence. With good DSD sources and this output method, music simply fills the room with a sense of flow that has to be heard, and a soundstage that is entirely free-floating, seemingly with no relation to the speaker’s locations. I lack the words to more properly describe it but I’d be inclined to make the comparison with analog replay, even if these two formats will never really sound the same. 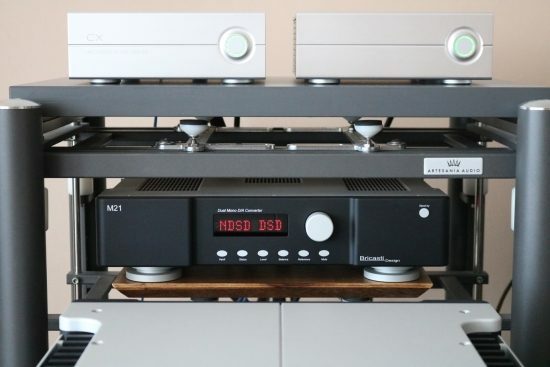 If ever a DAC came close to this ideal, though, the M21 is it. The M21 is UPnP and Roon compatible and indeed, it works with Roon right away, without any fiddling. 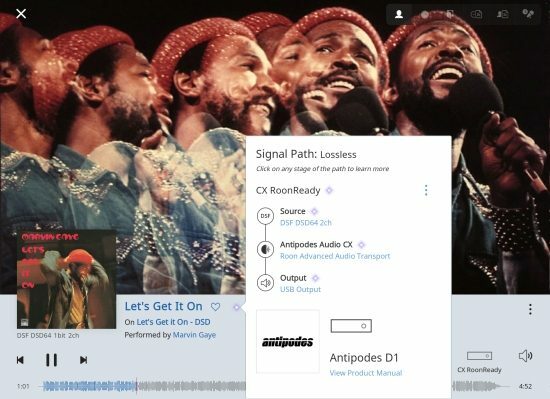 All one needs to do is to enable the output in the Roon Audio setup, in this case, the Antipodes CX, connect the M21 via Ethernet and that’s it. 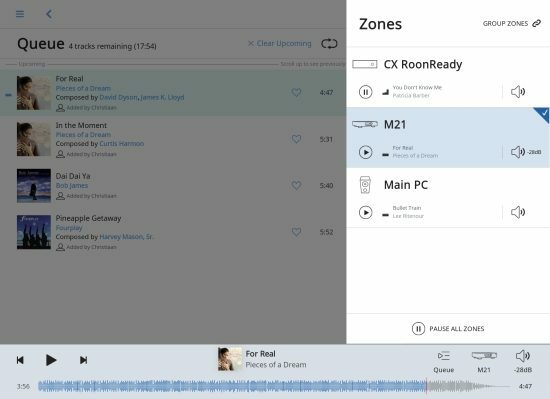 When connected via LAN, the correct input is automatically selected on the M21 when starting music playback from the Roon application. What’s also very convenient is that the M21’s volume level can be controlled directly from the Roon app. 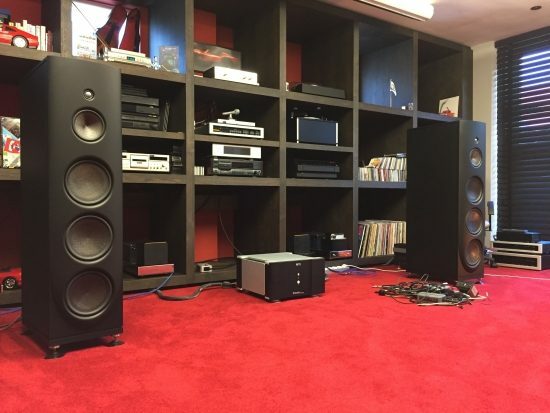 Sonically, the direct Roon performance is clean, refined, and pure but not at all analytical. The delivery does differ from the Antipodes delivery which itself is different depending on whether USB is taken directly from the CX (where Roon Server resided) or the EX (as a Renderer). Whether any of these methods sounds best or could be regarded as being best, however, is very much a personal matter. 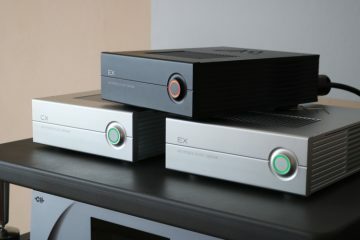 All I can say is that Antipodes has always had a fuller and more sonorous sound and the CX and EX are no different, both having a more solid and full-bodied, and more obviously 3D sound via USB into the M21 than the direct Roon ethernet connection. Now, it could be argued that the M21 provides the most neutral approach and by extension, the Antipodes delivery could be regarded as deviating from neutrality. Honestly, I can’t say if that is the case or not but I can confirm that USB output from the CX sounds closer to the M21’s direct Ethernet sound than the CX via direct Ethernet into the EX and the latter via USB to the M21. Personally, I am very much tempted by the M21’s pure and clean delivery, especially now that I don’t really need the added bass heft with the Kroma’s anymore, but on the other hand, with the A1.5 at least, I quite like the deeper soundstage and greater sense of being engulfed in sound which the Antipodes combo does so nicely. Just like Roon, UPnP also works flawlessly, again, with no configuration required on the M21. 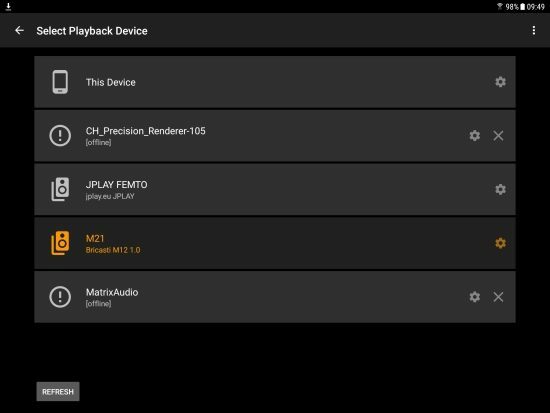 When it is connected, it will appear in the streaming app as M21. I should note that there is a difference in performance depending on whether the M21 (or any streaming endpoint) is connected to a network switch or the server’s direct output (if possible). 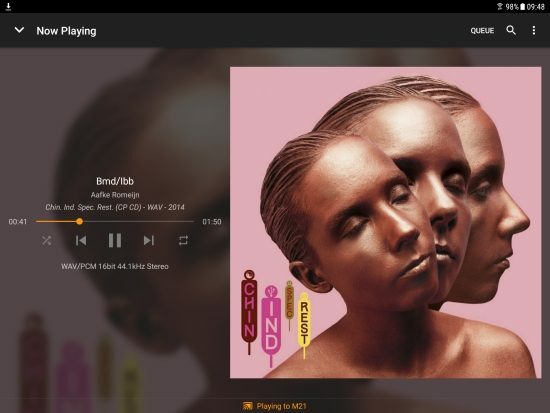 With the Melco N1ZH, for example, its dedicated player output sounds more solid and energetic than a connection via a network switch. Using the same Ethernet cable as used for the Antipodes comparison, the Melco N1ZH now provided the server duties. 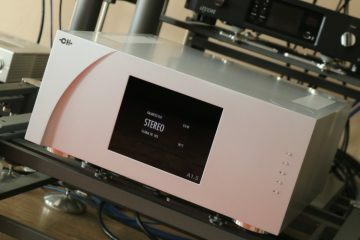 As can be read in the Antipodes review, I already compared these servers to the Melco using the CH Precision C1 DAC and I am glad to report that the M21 behaves pretty much in the same manner, meaning that it is very transparent to the source that feeds it. In this combination, too, the M21 sounds very pure and transparent and a little bit leaner/tighter than with the Antipodes and Roon while the latter combination again counters with a richer and slightly more full-bodied sound. The usually more enveloping 3D effect of the Antipodes server was less distinct in this case, to the point of not being of importance. Both deliveries are simply very appealing and I can’t really decide between the two based on audiophile aspects. In my case, ultimately, the decision between the two is driven by the convenience of the Roon application itself. Just as with the M15, I find it very easy to relax with the M21’s delivery. Its presentation is fluid, open, airy, detailed, dynamic, and very natural. No matter how you connect it, the M21 performs flawlessly and I have to say that I really am quite impressed with it. 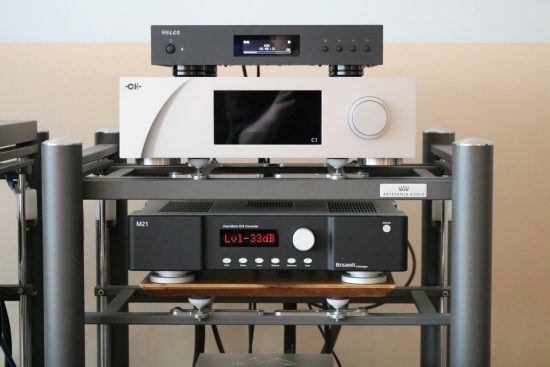 Of course, I am spoilt and have become removed from real-world, mass-produced equipment, but I don’t even find its price so crazy, considering that it combines a Streaming Endpoint, three separate DACs, and an analog preamp in a single component. The only component that I know that performs in the same league and also offers similar functionality is my CH Precision C1, which, complete with USB and Ethernet expansion cards tips the scale at an eye-watering 40K. Hi Michael, Oh, I’m sure that pure DSD should be bliss:-) But I haven’t tried it.